I have to hold my hand up at the outset and acknowledge that this post is going to be little more than a highly abridged version of Gary Taubes work in “The Diet Delusion“. That is to say, your time may be profitably spent reading his book instead of this post. I’m writing this really only to vent my frustration at the endless repetition of myths that Taubes so compelling takes apart in his book. There have been a quite surprising volume of health/nutrition related programmes, and news features on UK television recently, ranging from: ‘Supersize vs. Superskinny’; to news coverage of the Harvard School of Public Health’s ‘Red meat increases cancer risk’ study; to Horizon documentaries like ‘The Truth About Fat’ and ‘The Truth About Exercise’. What I find particularly remarkable about so much of the content is not what’s included, but what’s left out. That is to say that all of these programmes that I have seen assume that the viewers are already in possession of various ‘facts’ that require no explanation or back up. Things that we all ‘know’, such as: Dietary fat is bad for you, saturated fat is especially bad for you, cholesterol is bad for you, vegetable oils are more healthy than animal fats, wholegrains are healthy, high fibre is good, starches should form the basis of our meals, milk is healthy if it’s low fat…etc.etc. Some time ago I saw another news story in which a member of the public was interviewed about lifestyle, and came out with the line: “We all know how to eat healthily…”. Obviously this is true, we’ve all heard it many times, and we can look at the Department of Health website if we’re not sure, that will show us the ‘Eatwell Plate’ to guide us to the right choices. This is the conventional wisdom: low fat, high carbohydrate; 5 a day; and, increasingly, eat less meat. The question that Taubes set out to answer in “The Diet Delusion” was: ‘If we know so much about healthy eating, and sales of low fat and fat free foods have been so strong, why are obesity (and heart disease) rates still rocketing up?’ The answer, of course, is that we’ve been given bad advice on how to eat for the last fifty years or so. Horizon’s ‘The Truth About Exercise’ was the first programme to make me think about the regurgitation of conventional wisdom. The point of the programme was apparently to look at how exercise might prevent the presenter form succumbing to diabetes. One of the segments looked at his blood lipids (how much fat was in his blood) after eating, and if exercising before eating had an impact on his blood lipid profile. The meal used for this was a ‘typical’ Scottish breakfast. The expert, Dr John Gill of the Institute of Cardiovascular and Medical Sciences at Glasgow University made a point of the fat in the breakfast (making no mention of the sugars present in the beans, bread, tomato etc. ), and then took some of the presenter’s blood after eating, showing the viewer the level of fat in his blood. The message was very clear – eat fat, and the fat in your blood will increase. I’m no biochemist, but my understanding is that the mechanisms of digestion are a little more complicated than that. For example, if you’re eating fruit, and you’re muscle stores are full of glycogen then your liver will turn the fructose from the fruit into triglycerides (fat) that will then be transported by your blood to fat cells. Horizon also presented ‘The Truth About Fat’ a couple of weeks later. It was refreshing to see that the gastric surgeon turned presenter for the programme changed her view of obese people (it turns out they don’t just lack her self-control). Disappointing to find that the ‘Truth’ that the programme offered lay in surgery, or hormone regulation medication that may be developed. Also disappointing to see the presenter selling the programme on breakfast television and casually mentioning the hormones that make fat people “want fatty foods”. A throwaway remark perhaps, and yet more reinforcement of the idea that fat makes you fat. The evidence is that it is carbohydrate that makes you fat, and addicted to it, to boot. (Read ‘Wheatbelly‘ for more on the addictive properties of wheat in particular). The view of obese people often seems to be that they are greedy and lazy, and that if they only had more discipline, and exercised more, they would lose weight. I can accept that there are a lot of obese people who are continually consuming manifestly bad stuff – high sugar fizzy drinks, doughnuts etc., and I’m also sure that there are plenty of people who are trying hard to lose weight by “eating right”, but unsuccessful because what we’ve been told is the right way to eat is almost exactly the opposite of what will encourage weight loss. (According to Taubes the truth about healthy eating was being established by German scientists before the second world war but, tragically, there work was ignored – German science having been discredited by the horrors of the Nazi regieme). Another BBC news story that I happened upon was about the popularity of ‘free-from’ foods (gluten-free, dairy-free etc.). The segment confidently asserted that only 1-2% of us are allergic to certain foods (subtext = it’s a fad). Whilst a small percentage of people may be allergic to gluten, testing is often unreliable, and many more of us may not tolerate gluten well. You don’t have to be celiac to suffer negative effects from gluten, possieffecting not on the gut, but the brain! The dietician interviewed in the piece suggests that, if we exclude things like wheat and dairy, not only will we be eating a limited range of food, but we may be in danger of becoming malnourished (around 1:40 in the clip if you’re really interested). The story was followed by a discussion in the studio. The BBCs obligation to impartiality clearly doesn’t extend to nutrition, as the BBCs resident GP was the only person on hand to comment. Amongst her advice to viewers: “Do not consult a nutritionist, they are unregulated. Only consult a dietician” – like the one in the segment who thinks that eliminating wheat and dairy from your diet may result in malnutrition! 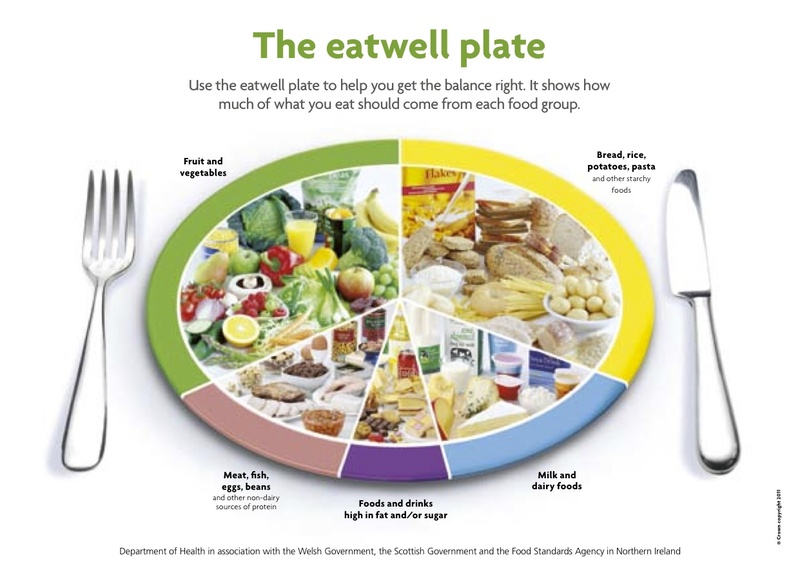 If you visit the website of the British Dietetic Association seeking advice on healthy eating you will quickly find yourself looking at the ‘Eatwell Plate’, pictured above. Yes, meals based on starches, that we know make us fat. In fact, unless we are indulging in regular endurance type activity, we do not need any dietary carbohydrate because, by a process called gluconeogenesis, our body can make carbohydrate from other sources. (I’m not advocating a zero-carb diet, just trying to underline the crassness of suggesting that carbohydrate needs to form the basis of all our meals). There was no explanation of any possible mechanism, no-one to question how the data was gathered or interpreted. This was not a clinical trial that could legitimately be said to prove anything, yet the ‘findings’ were presented as incontravertible fact. Later that day in the gym I heard a trainer confidently asserting that his client must get his protein needs from sources other than red meat. Fairy tale has become fact. You might well argue that misrepresentations about eating red meat are less serious than those about how we become and remain fat – the consequences of people eating less red meat aren’t likely to be nearly as serious as the consequences ofoverweight people beingadvised to eat less fat and more starch (slow releasing sugar is still sugar). The pressing question is how we can be fit and well as a society if poor information, through repetition (often by authority figures), becomes popular belief? What’s the definition of insanity? How about repeating the low fat/high carbohydrate mantra and expecting obesity/cardio vascular disease rates to go down. There’s a wealth of information available, not least of which is Taubes’ incredibly extensively referenced book. If you don’t fancy reading that, perhaps consider listening with a sceptic’s ear next time there’s a media story on nutrition/health.